Join our Rock 'n' Roll Cheer Section! Home › Latest News › Join our Rock 'n' Roll Cheer Section! We're excited to announce that we'll be staffing a water stop at the inaugural Rock 'n' Roll Raleigh Marathon & Half, which takes place Sunday, April 13th. We'll be doling out water, high fives, and encouragement at the final water stop on the course, near the 12-mile marker for half marathon participants and just after the 25-mile marker on the full marathon course. But we need your help! VOLUNTEER FOR THE RACE CREW! 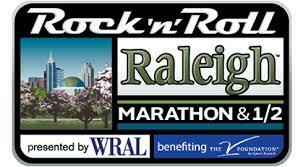 The Rock ‘n’ Roll Raleigh Marathon & 1/2 Marathon presented by WRAL benefiting the V Foundation for Cancer Research is rockin’ through your neighborhood April 10-13. Nearly 12,500 runners will race to the finish. Volunteering for the Race Crew means you will not only be supporting thousands of aspiring runners and walkers, but also the community of Raleigh. We need your help to make this event spectacular. Our 2014 Charity Partners are: The V Foundation for Cancer Research; the Leukemia & Lymphoma Society; the American Diabetes Association; STOMP the Monster NC; Sixty Feet-Run for Justice.